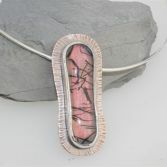 Beautiful Dichroic Glass Cabochon Necklace set into a handcrafted Fine Silver surround and Copper setting. 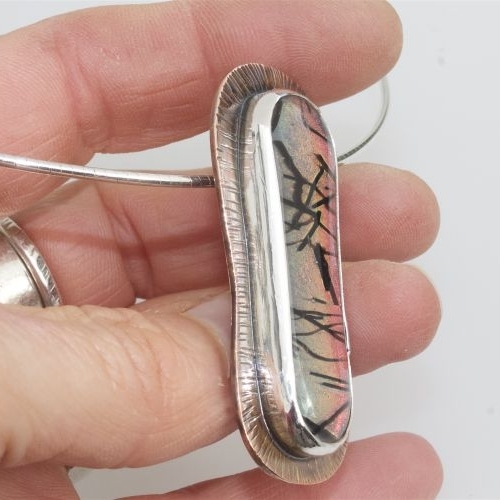 I have also handcrafted the Glass cabochon by layering glass and melting them so become on in my Kiln. 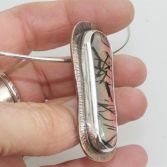 Both the Glass cabochon and setting are a one of a kind as I have only made one of these, you will receive the necklace shown in the images. 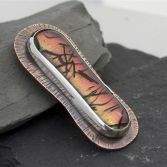 This large Dichroic Glass cabochon is a beautiful and an unusual shape the glass is iridescent and changes colours from oranges to blues and greys there are also black flecks giving it real interest. The size of the Glass & setting is 5.4cm long by 2.3cm at widest point. 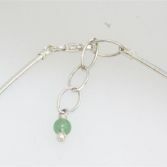 It is hung on a solid sterling silver Omega chain which is 1.6mm thick (almost like a solid choker but with some flexing) The Omega chain is 16 inches long and has a trigger clasp and and extension chain of 1 inches so the pendant can be worn anywhere between 16 inches or 17 inches, at the end of the extension chain is a Aventurine semi precious bead. 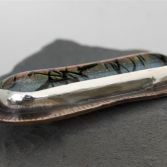 The Dichroic Cabochon pendant and Omega chain will be presented in one of my signature gift boxes and posted via Royal Mail 1st class signed for delivery to any UK address free of charge. 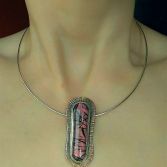 This is a one of a kind necklace!